Casey Jones, a doctoral student in civil engineering, has been selected to present his research at the fib International Ph.D. Symposium in Civil Engineering. The conference will be held Aug. 29-31 in Prague. Jones' research is centered on improving the longevity of concrete pavements. He is specifically working to reduce structural deterioration caused by deicing salts. When icy roadways are treated with salt, the salt can work its way into the roadway joints, eventually compromising the joints and creating a structural hazard that must be remediated. "Pavements are usually designed in 30-50-year design lives," Jones said. "The damage caused by deicing salts can reduce the lifespan by 15-20 years. But, there are reported instances of having to replace joint sections after five years, due to salt deterioration." 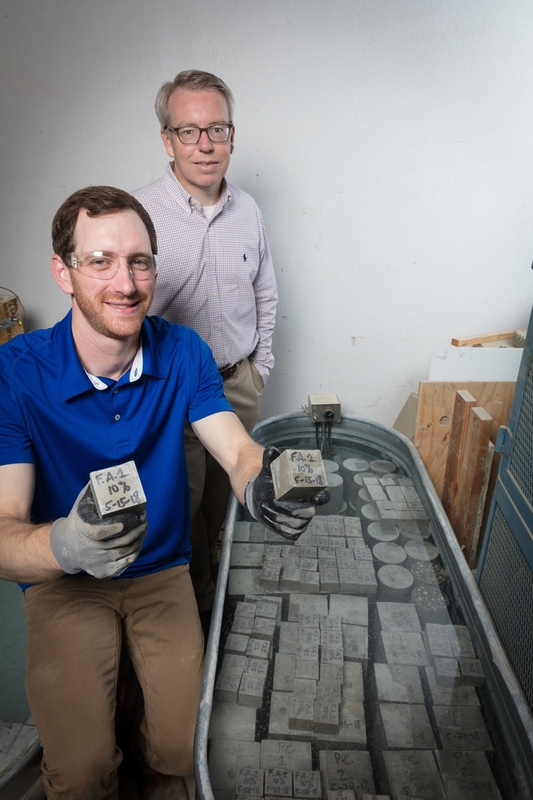 Jones, a Doctoral Academy Fellow, is examining the feasibility of replacing the cement used in concrete with fly ash, a recyclable material from the coal industry. "Fly ash can provide better long-term durability and reduced permeability," he said. "It is also considerably cheaper than cement." Fly ash does come with some drawbacks, however. There can be scaling with fly ash, meaning the top layer of the pavement erodes away. Fly ash also has reduced early compressive strength, which could cause the concrete to take longer to mold. Though, long-term, fly ash concrete is typically stronger than portland cement concrete. "I am working to determine appropriate replacement rates for fly ash," Jones said. "I'm trying to see at what level we can increase our fly ash to get decent longevity, but not go too far where the fly ash begins to act in a negative manner. It's a balancing act." Fly ash replacement research is being actively looked at in northern parts of the United States and in Canada. Jones, a native of Scott, Arkansas, believes the research is relevant for Arkansas as well. "Arkansas may not go into long-term deep freezing, but we have a lot of those 28-40-degree temperature ranges where we're going to put some type of preventative on the road if there is wintry weather," he said. "So, we do get enough use of those deicing salts for there to be long-term problems." Jones began his doctoral program in spring 2017, so he is still in the early stages of his research. However, he is excited to see where the research leads and is thankful to have the support of his adviser Micah Hale. "Dr. Hale is really great," he said. "He gives me the support I need, but he also gives me the freedom to take the lead on my work. Really, the entire civil engineering department has given me great support." The support Jones has received from his department and the campus influenced his decision to call the University of Arkansas home for his entire academic career. Jones earned both bachelor's and master's degrees in civil engineering from the University of Arkansas, and he hope to complete his doctoral degree in spring 2020.